Astronomers have detected a highly collimated, bipolar jet from the so-called Red Square Nebula (RSN) surrounding the B[e]-type star MWC 922. The newly discovered jet could reveal more insights into the nature of the RSN and its emission. The finding is detailed in a paper published January 24 on the arXiv pre-print repository. Located approximately 5,500 light years away in the constellation Serpens, MWC 922 is a peculiar, infrared excess B[e] star surrounded by a square-shaped nebula. Many studies of the RSN have been carried out to date, which, for instance, revealed another nebula similar to RSN, however, little is known about the properties and evolution of RSN and MWC 922. Now, a new study conducted by University of Colorado’s John Bally and Zen H. Chia, sheds more light on the nature of RSN and its host. Using the Double Imaging Spectrograph (DIS) on the 3.5 meter telescope at the Apache Point Observatory (APO) located near Sunspot, New Mexico, the astronomers unveiled the presence of a collimated jet orthogonal to the previously identified extended nebula associated with RSN. 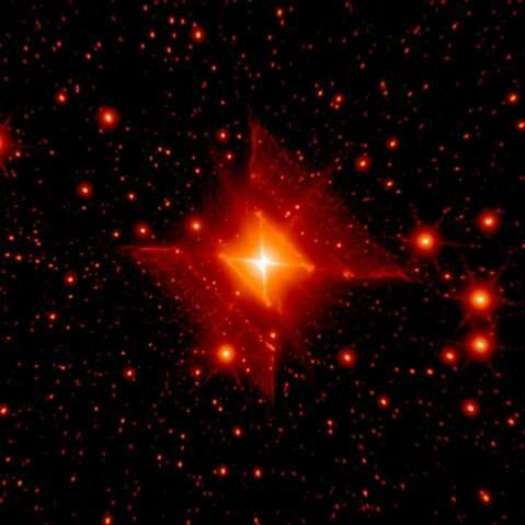 “Deep, narrow-band images of the Red Square Nebula and its source star, MWC 922, reveal a highly collimated and segmented, parsec-scale jet oriented orthogonal to the previously identified emission-line nebula which can be traced towards the southwest,” the researchers wrote in the paper. According to the study, the jet, as well as RSN, appear to be externally ionized. Describing the structure of the newfound jet, Bally and Chia revealed that it consists of a pair of segments with sizes of 0.5 light years each, on either side of the host star, separated by gaps. They noted that the most distant jet segments disappear at around 1.97 light years from the star. The researchers calculated that the speed of the jet is around 500 km/s and that the jet’s electron density is between 50 and 100 cm-3. These parameters allowed the authors of the paper to estimate the mass loss rate of the jet segments, which was found to be at a value between 50 and 100 billionths of a solar mass per year. Trying to explain the real nature of the newly detected jet and the extended nebula, the scientists propose two hypotheses. The first scenario suggests that the observed features might be a large excretion disk or stream of ejecta shed by MWC 922 that is preferentially illuminated and ionized from the direction of the open cluster Messier 16. “Because of its orientation, the southwest part shadows the northeast part. Faint, 70 μm emission traces warm dust at the surface,” the paper reads. The second theory proposed by the researchers is based on the assumption that MWC 922 may have been ejected from Messier 16. In this scenario, the jet might be a tail of ejecta left behind the star as mass lost from the star interacts with the interstellar medium through which it moves.